If you've ever been involved in a legal case, or have even watched a TV show about lawyers, you may have heard legal jargon bandied around by those involved. Maybe you've heard things like "punitive damages" or "pain and suffering," but no one has ever really explained what those terms mean. Well, wonder no longer. We're going to explain "pain and suffering," "damages," and what they would potentially mean to someone's case. Plain and simple: pain and suffering is the legal term that refers to physical and emotional stress caused from an injury. This is a form of General Damages. This can include a number of different things: temporary or permanent physical limitations, aches and spasms, depression, scarring, a potential shortening of life, and more. Injuries are the most obvious form of pain and suffering as it pertains to a legal case. However, pain and suffering can extend to emotional or mental trauma suffered from an accident. It can be more difficult to prove these elements of pain and suffering, especially without the help of an attorney. It's important to be able to connect them with the accident that occurred. That can be the difficult step without the proper resources. Compensatory Damages – This includes things like pain and suffering, economic losses, lost earnings, property damages, and more. Within Compensatory Damages there are even MORE categories. Punitive Damages – These are Damages that are essentially enacted to keep the defendant from repeating his or her crime. They are typically awarded when Compensatory Damages are seen as an inadequate amount of compensation. For the most part, we'll be discussing Compensatory Damages. Within this category of Damages, there are a few more subcategories, including: Special Damages and General Damages. Special Damages: These Damages can be quantified, which is what sets them apart from other forms of Damages. This refers to losses that can be tracked directly. Unpaid medical bills, lost wages/paychecks, damage to your property, etc. General Damages: These Damages are more difficult to quantify, meaning they might not be as obvious at first. They include things like pain and suffering, disfigurement, loss of companionship, loss of enjoyment of life, and more. An attorney will best be able to help you understand General Damages. If this all seems confusing, that's because it is. Many people assume they're able to pursue compensation for pain and suffering, when they should be looking to recover money for Special Damages. Or vice versa. Or both. 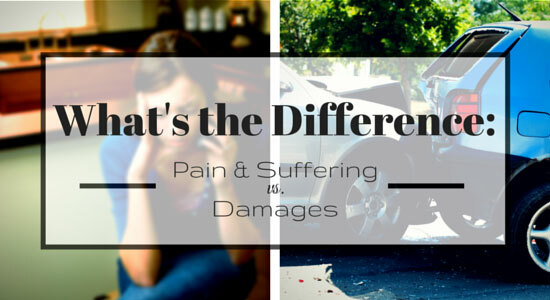 In an auto accident, pain and suffering is extremely important. However, only those insured with Full Tort will be ensured the right to pursue compensation for pain and suffering. It's always best to trust the real attorneys – not the ones from movies and TV shows – so you can truly understand the complexities of a lawsuit. As always, if you're ever injured in an accident, we'll help you recover all the compensation to which you're entitled. It's free to call and speak with us, and you're never required to hire our firm when you call.